Decouple soffits, top plates, ceiling fans, acoustical grid ceilings, etc. The GenieClip® LB is the accessory clip to the GenieClip® RST. This multipurpose L bracket resilient clip can be used in a variety of applications where structural support is required including wall sway bracing, ceiling suspension for fixed and acoustic grid ceilings, and accessory mounting including isolation of ceiling fans and recessed light boxes like our QuietBox. The GenieClip® LB is designed to support significantly more weight than the typical L bracket resilient clip. Each GenieClip® LB holds an impressive 108 pound minimum pullout and shear rating. Made from recycled components, the GenieClip® LB contributes to LEED certified building. The number of clips needed for your assembly will vary greatly depending on your assembly type and weight of the assembly. Spacing of 24" on center to decouple the top plate framing is most common. 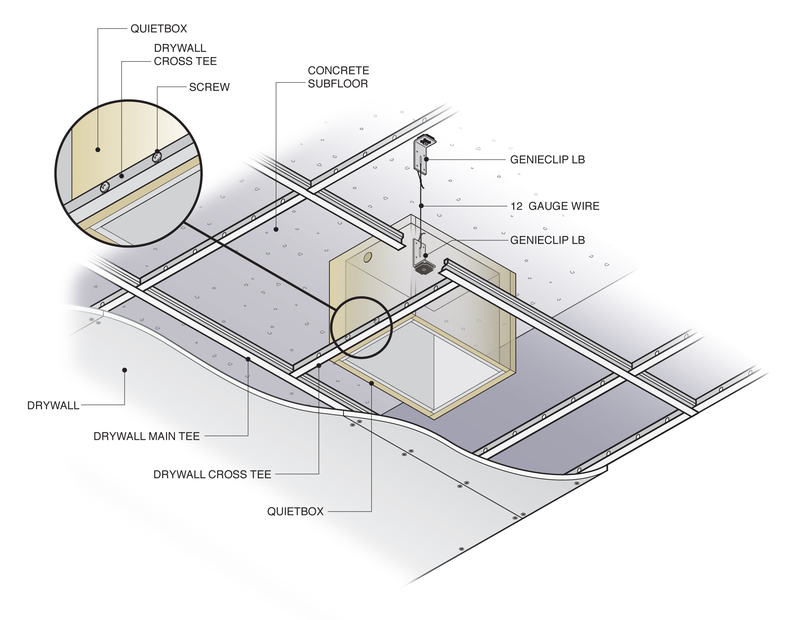 Framing block isolation usually requires 2 or 3 GenieClip® LB depending on the weight involved. Please refer to the installation drawings for more information on common spacing and assemblies with the GenieClip® LB. The GenieClip® LB can be used in a variety of applications where structural support is required including wall sway bracing, ceiling suspension for fixed and acoustic grid ceilings, and accessory mounting including isolation of ceiling fans and recessed light boxes like our QuietBox. Below are links to PDF drawings of the various uses for the GenieClip® LB. Use a #8 2-1/2" flat head coarse thread screw to attach to wood framing and a #8, #10, or #12 1-5/8" pan head fine thread self tapping screw to attach to metal framing. Standard drywall screws fit into the pre-drilled holes on the GenieClip® LB.